Blessings, Miracles, &Thoughts in Between: Menu Monday! 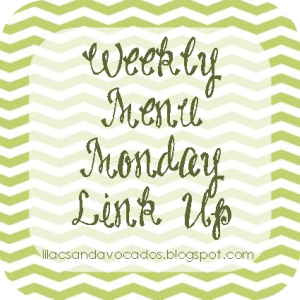 I've always been hesitant to link up with Rachel for Menu Monday but today I am taking the plunge! I do a lot of cooking on the weekend so we never have a Monday - Friday menu; ours is more like Saturday - Thursday. It's just easier for me to cook things while Alex is home. We normally eat left overs or I use something I've made in a different way later in the week. I've realized that, regardless of the day I cook the meal, people are interested in what others are eating! I have ladies ask me for recipes on twitter all the time and I am always browsing other menus to get new ideas. So, who cares about what day I cook a meal? All anyone cares about is what that meal may be! So, here is our menu! Because I know I will have questions - the Hatch Chile Carnitas came pre-seasoned from HEB (a Texas grocery store) and are AMAZING! RUN to HEB and pick some up if you are a Texan! I put them in the crock pot with a diced onion and minced garlic. Cooked until tender. Then Alex moved them over to the grill (in a grill pan) and cooked them on low until there was a nice crust on the meat. Seriously amazing. I've had several people ask for the Eggplant Parmesan recipe on twitter this weekend. It's something I threw together one night after reading several recipes on line. So, not completely original but there is no recipe to link! I don't measure when I cook - sorry! I probably should start doing that if I'm going to share recipes from my kitchen! Also I am absolutely horrible at telling you how to make things! So sorry! Feel free to ask questions if I haven't been clear! In a pie plate (makes coating easiest) mix plain breadcrumbs, salt, pepper, Italian season, garlic powder, pinch of red pepper flakes, and some Parmesan cheese together. Note: I always accidentally under season my breadcrumbs. Be sure to add enough seasoning - it takes way more than you think! Dip eggplant slices into eggs and then place in pie plate to coat with breadcrumbs. Place on baking sheet. Bake at 425 for 5-6 minutes. Flip eggplant and bake another 4-5 minutes. In a baking dish (size will depend on how much you make), spread a thin layer of red sauce in the bottom. Layer baked eggplant, mozzarella, and red sauce until you have used all of the eggplant. End layering with red sauce and top with mozzarella and Parmesan. Broil for about 3 minutes to brown cheese. I normally serve mine with some type of pasta as I never use all of the sauce I have frozen. You could easily half the recipe (1 eggplant, 1 egg, 1 jar sauce) if you don't like left overs or are making it for only 1-2 people. I have a husband that loves to eat and a toddler that LOVES eggplant parm so I make a HUGE dish of it. If anyone is interested I can share my homemade red sauce this week or next! I need to think through it first because, like I mentioned, I don't measure and honestly have no clue how to even begin writing a recipe for it! I'm thinking about starting to either label my recipe posts or have them all feed over into a recipe page up top. Would anyone use that feature? Dumb? Good idea? Let me know! What are y'all eating this week? I'd love to hear so I can get some new ideas! My husband found this recipe over the weekend and is planning to make it tonight. It looks tasty, and something that Gwen can eat along with us! Tomorrow we'll probably have pasta with some herbed cheese with dried tomatoes I made a few weeks back and then popped into the freezer since we were traveling. I took it out last night and it looks to have defrosted just fine, and I think it will be good over pasta. Haven't thought any further ahead than that! Yum! The soup sounds great, too! This week, we're having fish tacos, grilled pork loin with avocado/mango salsa, turkey burgers and sweet potato fries, and a Southwestern Caesar salad w/ chicken. I love this post, it gave me some great ideas! I love eggplant parmesan! I don't make it often because it always seems like a lot of work, but I'm so glad when I do. It's so yummy! Question though: Does Kate eat everything you cook? I have problems with getting Stella to eat anything other than tacos, broccoli & cheese, or pizza.